At Living Media we are proud of the fact that so much of our work is led by talented, young, local Haitian people that just want to see their community grow in beauty and in possibility. Everything that we do, however would not be possible without the work of a dedicated board of directors in the United States that helps us find the resources and make the connections that we need to accomplish our work. Our board is made up of 8 members who all play a special role in supporting the work of Living Media International. The board, just recently grew to 8 members as we added two new contributors, Elsie Balu, and Matt Morrison. As the work that we do in Haiti grows and reaches new areas of impact, we have also found it necessary to expand our system of support through the board. You can find out more about Elsie and Matt, as well as our other board members by visiting the page in our Who We Are section. We are looking forward to seeing how these two are able to jump in and add their ideas and skills to the ongoing work of Living Media which, like any work of art, is always stronger the more we collaborate across cultures. One thing that makes our board at Living Media special is that they do much more than just sit in meetings and make decisions. Every single one of the members is actively involved in our work. They believe in the work so much, in fact, that 100% of our board donates to Living Media financially! This is a remarkable sign of support, especially considering that most of our board are professionals in artistic fields, which are not known to make people rich. We have visual artists, designers, writers, and musicians on our board, as well as educators, pastors, and social workers. Although it is an encouraging fact that they all are willing to give out of their own pockets, we choose our board members on many qualities other than the size of their bank account. We have tried to fill the board with individuals who are able to contribute with creative, organizational, social, and moral skills that are all truly priceless. Not only do they give of their financial gifts and talents, but all of our board members have also made an effort to give of their presence here in Haiti. With the exception of one of our brand new members (who is making plans in the near future to travel), each person on the board has made at least one trip to Mizak in Haiti to witness our programs first hand, work together with our staff, and get a better understanding of the place and culture that we work in. This hands on involvement makes our board much more effective representatives of the work we do while they advocate for us and help us reach our goals. Just a couple of weeks ago, our treasurer, Ellen, traveled to Mizak from her home in Michigan and spent more than a week painting at New Life School, planning with the school staff for the future, and working with the Living Media staff of directors to implement better accounting and reporting procedures. Because of her work we have a lot to look forward to. The day that the students return to class in the fall to see their finished school all painted and beautiful will be a truly momentous occasion for all! Because of the other work Ellen had done with the staff we can look forward to greater transparency in our finances as better communications among our directors. In addition to Ellen, we have had the pleasure of welcoming Elsie to Mizak recently as well. Although she’s only been on the board for a month she’s already jumping in and helping out with our child sponsorship and dreamer programs to strengthen the operations of both. We are lucky that she lives in Petionville, so the trip to see us in Mizak is not quite as extensive as it is for many of our other board members. Now we are looking forward to seeing Pastor Terry in the next month as well and the staff always looks forward to his encouraging guidance and positive attitude. 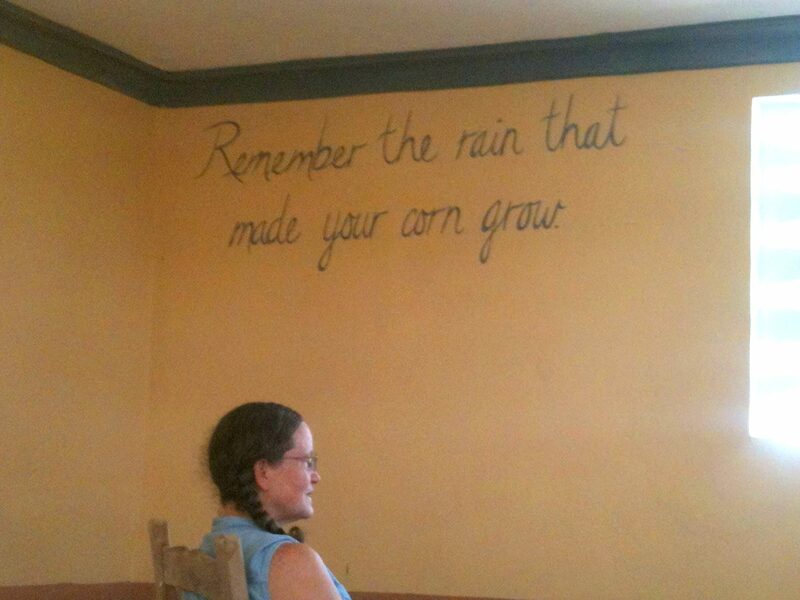 While Ellen was in Mizak, she got to paint a special proverb on the walls on one of the classrooms at New Life, “Remember the rain that made your corn grow.” At Living Media we are fortunate to have a skilled group of staff, artists, and volunteers in Haiti, who do the work of preparing and planting the fields that are our community work. On the board of directors we are happy to just water the seeds and watch them grow. Then we can all celebrate together in the harvest of better educated, more creative youth in our communities. Next PostSponsor a Classroom at New Life!